Considering this was the hottest weekend of the summer, I spent way too much time outside. When I left the rally (2 hours was all I could handle), SpeedyKate and I opted to escape the sun and do an indoor pool workout at Wilson. Our pool “long runs” are intense, but in a good way. I actually think I’m getting better workouts in the pool than I would be running outside in this dog’s mouth of a climate. Post-pool I was tired, but that didn’t stop me from making the trek up 15th street to attend LOTR-Emily’s bar-b-q. We alternated between the back patio and her kitchen, both equally hot and sweaty locations. The good news is that when everyone is the same degree of soaked-in-sweat it really doesn't matter. 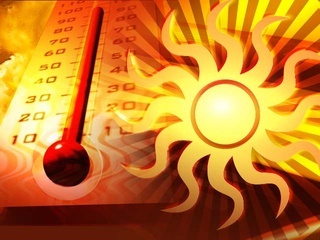 Sunday was a pleasant high-90s (oxymoron? Yes. But accurate. 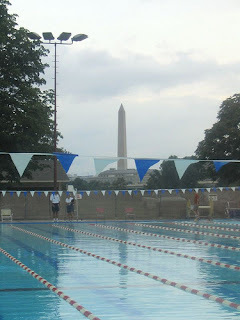 ), so Kate and I tanned our shoulders and noses pool running outside at East Potomac Pool on Hains Point. We spent 90 minutes running, then a few more lounging in the water. By Sunday evening I was exhausted and ready for a relaxing movie experience. Months ago I bought a Living Social coupon for West End Cinema in Foggy Bottom. I met a few friends to see The Trip, a movie that walked the fine line between funny and weird/boring, and luckily managed to stay on the funny side of that line. I’m hesitant to recommend this movie, since I imagine a lot of people might hate it. But I can say that I laughed and enjoyed it – I like dry British humor.